Synopsis: Charlie Bucktin is both alarmed and gratified when Jasper Jones first knocks on his window. However, he soon wishes not to share Jasper’s secret and it weighs heavily on him over the summer. The sleepy town where he grew up, that seemed so safe becomes a place of secrets, violence and prejudice that he desperately wants to escape. This book had me from the first. Charlie’s excitement and worry is almost palpable when Jasper Jones, town outcast, first comes to his window to ask for help. Their journey to Jasper’s hideout is agonising. The suffocating weather doesn’t help. You can almost feel the heat. Of course, from the synopsis of the novel, you realise that Jasper has probably discovered a body so that wasn’t really a surprise but the boys decision to cut the body of Laura Wishart down and throw it into the river so that Jasper will not be blamed for her death is a little more shocking. Events soon start to spiral. Charlie finds it hard to live with his knowledge and that contributes to his disintergrating relationship with his mother. He starts to fall in love with Laura’s sister which makes his secret knowledge all the more uncomfortable. Jasper’s decision to confront who he assumes is the killer reveals town secrets that go back decades. The seemingly innocent town reveals its darker side with a series of racial incidents. Charlie was a lively and intelligent narrator who read as if his life depended on it. He describes life in the town vividly, as well as his own insecurities and worries. The novel is full of school boy humour through his conversations with his best friend. It was easy to read and compelling enough to want to read on. 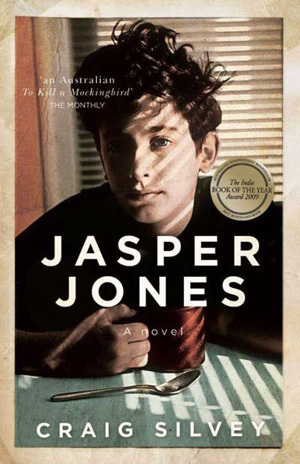 Jasper Jones, as the town outsider, blamed for everything, was full of pathos but never pathetic. If I have any complaints, it would be that it was easy to see what the reveals were going to be. There were no surprises although the bad luck that might have saved Laura’s life was well plotted and interesting. Having said that, I always wanted to read on to see how Charlie and Jasper would react to the events as they unfolded. The issues in this novel were skilfully handled. There was no preaching, just the sense of a young person trying to find their way in an increasingly difficult world.